So, you've blinked some LEDs with Arduino, and maybe you've even drawn some pretty pictures with Processing - what's next? At this point you may be thinking, 'I wonder if there's a way to get Arduino and Processing to communicate to each other?'. Well, guess what - there is! - and this tutorial is going to show you how. Let's start with the Arduino side of things. We'll show you the basics of how to set up your Arduino sketch to send information over serial. First things first. 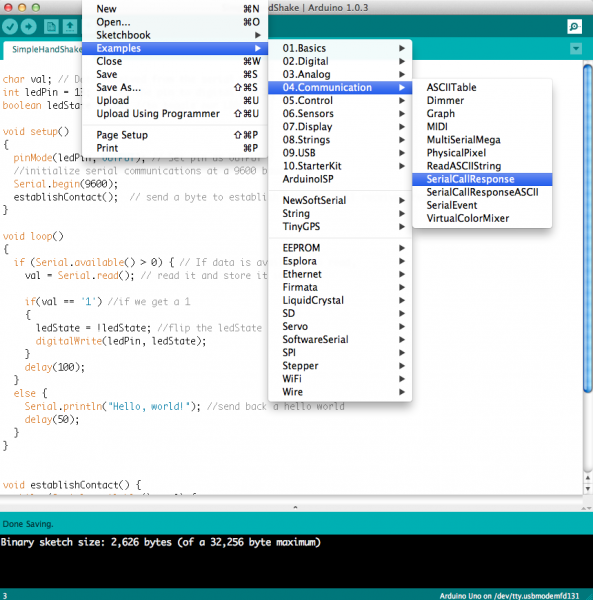 If you haven't done so yet, download and install the Arduino software for your operating system. Here's a tutorial if you get stuck. You'll also need an Arduino-compatible microcontroller and an appropriate way to connect it to your computer (an A-to-B USB cable, micro USB, or FTDI breakout). Check this comparison guide if you're not sure what's right for you. Ok. You should by this point have the Arduino software installed, an Arduino board of some kind, and a cable. Now for some coding! Don't worry, it's quite straightforward. This is called our setup method. It's where we 'set up' our program. Here, we're using it to start serial communication from the Arduino to our computer at a baud rate of 9600. For now, all you need to now about baud rate is that (basically) it's the rate at which we're sending data to the computer, and if we're sending and receiving data at different rates, everything goes all gobbledy-gook and one side can't understand the other. This is bad. All that's left to do is to plug in your Arduino board, select your board type (under Tools -> Board Type) and your Serial port (under Tools -> Serial Port) and hit the 'upload' button to load your code onto the Arduino. Now we're ready to see if we can magically (or through code) detect the 'Hello, world!' string we're sending from Processing. In order to listen to any serial communication we have to get a Serial object (we call it myPort but you can it whatever you like), which lets us listen in on a serial port on our computer for any incoming data. We also need a variable to recieve the actual data coming in. In this case, since we're sending a String (the sequence of characters 'Hello, World!') 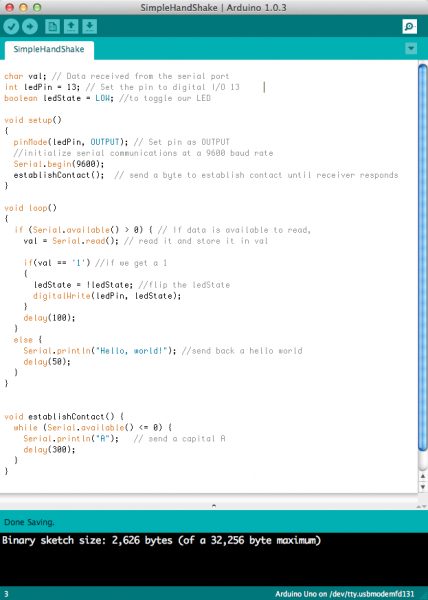 from Arduino, we want to receive a String in Processing. Just like Arduino has setup() and loop(), Processing has setup() and draw() (instead of loop). For our setup() method in Processing, we're going to find the serial port our Arduino is connected to and set up our Serial object to listen to that port. // On Windows machines, this generally opens COM1. 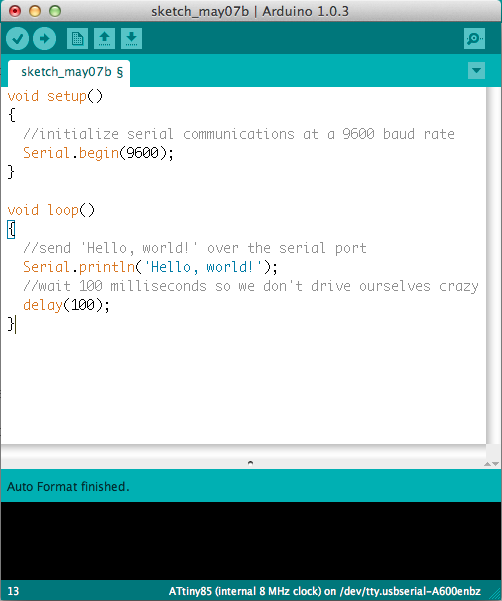 Remember how we set Serial.begin(9600) in Arduino? Well, if we don't want that gobbledy-gook I was talking about, we had better put 9600 as that last argument in our Serial object in Processing as well. This way Arduino and Processing are communicating at the same rate. Happy times! In our draw() loop, we're going to listen in on our Serial port and we get something, stick that something in our val variable and print it to the console (that black area at the bottom of your Processing sketch). Excellent! 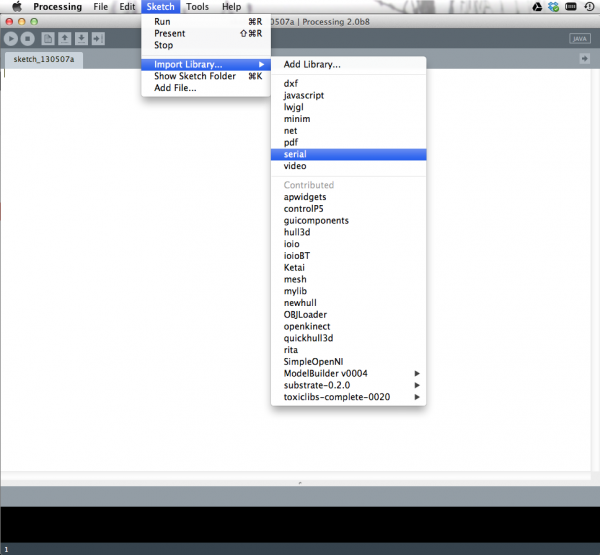 We've now conquered how to send data from Arduino to Processing. Our next step is figure out how go the opposite way - sending data from Processing to Arduino. So we've sent data from Arduino to Processing, but what if we want to send data the other way - from Processing to Arduino? Piece of cake! Let's start with the Processing side of things. It starts out much like our last sketch: we import the Serial library and declare a global Serial object variable for our port up top, and in our setup() method we find our port and initialize Serial communication on that port with our Serial variable at 9600 baud. 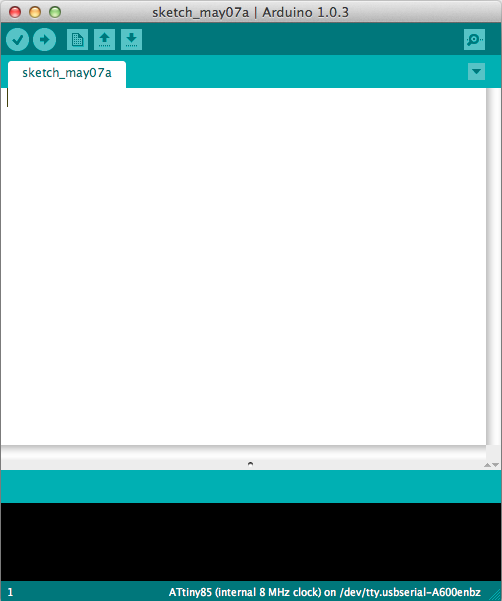 We're also going to use the size() command, to give us a little window to click in, which will trigger our sketch to send something over the Serial port to Arduino. 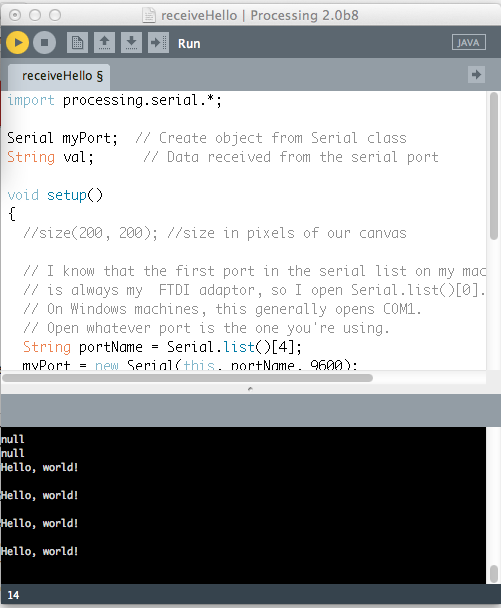 In our draw() loop, we send whatever we want over the serial port by using the write method from the Processing Serial library. For this sketch, we will send a '1' whenever we click our mouse in the Processing window. We'll also print it out on the console, just to see that we're actually sending something. If we aren't clicking we'll send a '0' instead. If you run this code, you should see a bunch of 1's appear in the console area whenever you click your mouse in the window. Neat! But how do we look for these 1's from Arduino? And what can we do with them? Ok! On this page we're going to look for those 1's coming in from Processing, and, if we see them, we're going to turn on an LED on pin 13 (on some Arduinos, like the Uno, pin 13 is the on-board LED, so you don't need an external LED to see this work). At the top of our Arduino sketch, we need two global variables - one for holding the data coming from Processing, and another to tell Arduino which pin our LED is hooked up to. Next, in our setup() method, we'll set the LED pin to an output, since we're powering an LED, and we'll start Serial communication at 9600 baud. Finally, in the loop() method, we'll look at the incoming serial data. If we see a '1', we set the LED to HIGH (or on), and if we don't (e.g. we see a '0' instead), we turn the LED off. At the end of the loop, we put in a small delay to help the Arduino keep up with the serial stream. Voila! 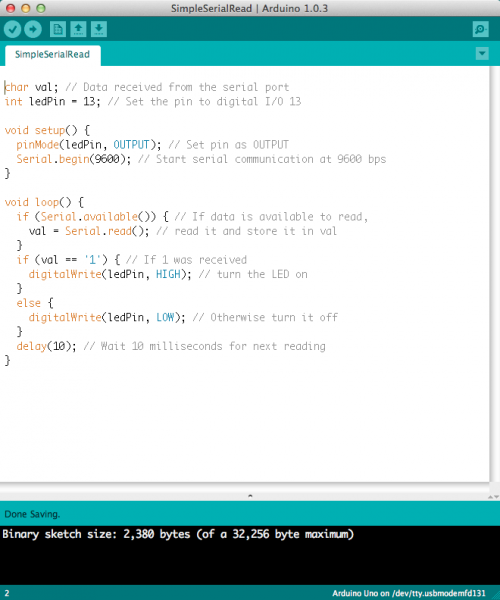 If we load up this code onto our Arduino, and run the Processing sketch from the previous page, you should be able to turn on an LED attached to pin 13 of your Arduino, simply by clicking within the Processing canvas. So far we've shown that Arduino and Processing can communicate via serial when one is talking and the other is listening. Can we make a link that allows data to flow both ways, so that Arduino and Processing are both sending and receiving data? You bet! In the biz we call this a serial 'handshake', since both sides have to agree when to send and receive data. On this page and the next, we're going to combine our two previous examples in such a way that Processing can both receive 'Hello, world!' from Arduino AND send a 1 back to Arduino to toggle an LED. Of course, this also means that Arduino has to be able to send 'Hello, world!' while listening for a 1 from Processing. Whew! Let's start with the Arduino side of things. In order for this to run smoothly, both sides have to know what to listen for and what the other side is expecting to hear. We also want to minimize traffic over the serial port so we get more timely responses. Since we're trying to be efficient, we're going to change our code so that we only listen for 1's, and each time we hear a '1' we toggle the LED on or off. To do this we added a boolean (true or false) variable for the HIGH or LOW state of our LED. This means we don't have to constantly send a 1 or 0 from Processing, which frees up our serial port quite a bit. Our setup() method looks mostly the same, with the addition of an establishContact() function which we'll get to later - for now just type it in. In our loop function, we've just combined and slimmed down the code from our two earlier sketches. Most importantly, we've changed our LED code to toggle based on our new boolean value. The '!' means every time we see a one, we set the boolean to the opposite of what it was before (so LOW becomes HIGH or vice-versa). We also put our 'Hello, world!' in an else statement, so that we're only sending it when we haven't seen a '1' come in. Now we get to that establishContact() function we put in our setup() method. This function just sends out a string (the same one we'll need to look for in Processing) to see if it hears anything back - indicating that Processing is ready to receive data. It's like saying 'Marco' over and over until you hear a 'Polo' back from somewhere. That's it for the Arduino side, now on to Processing! For the Processing side of things, we've got to make a few changes. We're going to make use of the serialEvent() method, which gets called every time we see a specific character in the serial buffer, which acts as our delimiter - basically it tells Processing that we're done with a specific 'chunk' of data - in our case, one 'Hello, world!'. The beginning of our sketch is the same except for a new firstContact boolean, which let's us know when we've made a connection to Arduino. Our setup() function is the same as it was for our serial write program, except we added the myPort.bufferUntil('\n'); line. This let's us store the incoming data into a buffer, until we see a specific character we're looking for. 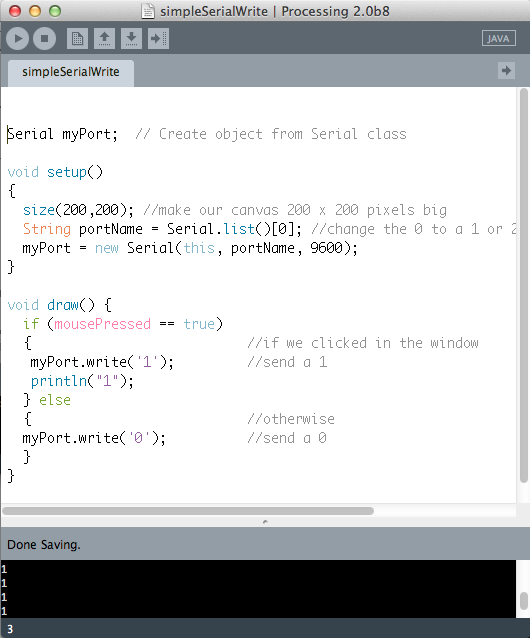 In this case, it's a carriage return (\n) because we sent a Serial.println from Arduino. The 'ln' at the end means the String is terminated with a carriage return, so we know that'll be the last thing we see. Oof. That's a lot to chew on, but if you read carefully line by line (especially the comments), it'll start to make sense. 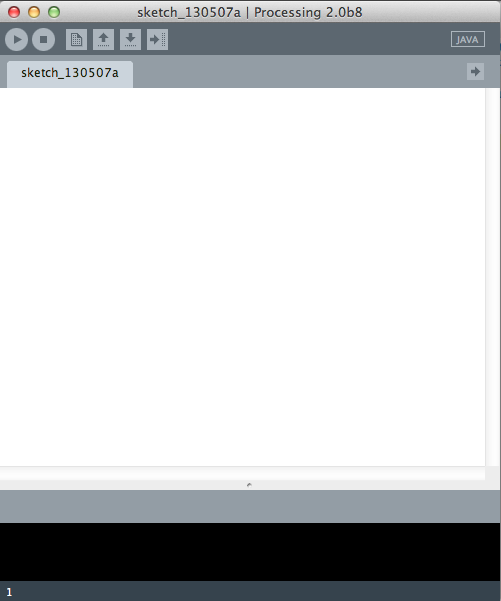 If you've got your Arduino code finished and loaded onto your board, try running this sketch. You should see 'Hello, world!' coming in on the console, and when you click in the Processing window, you should see the LED on pin 13 turn on and off. Success! You are now a serial handshake expert. In developing your own projects with Arduino and Processing, there are a few 'gotchas' that are helpful to keep in mind in case you get stuck. make sure you're reading off the right port in Processing - there's a Serial.list() command that will show you all the available ports you can connect to. if you're using the serialEvent() method, make sure to include the port.bufferUntil() function in your setup() method. also, make sure that whatever character you're buffering until (e.g., '\n') is a character that you're actually sending from Arduino. 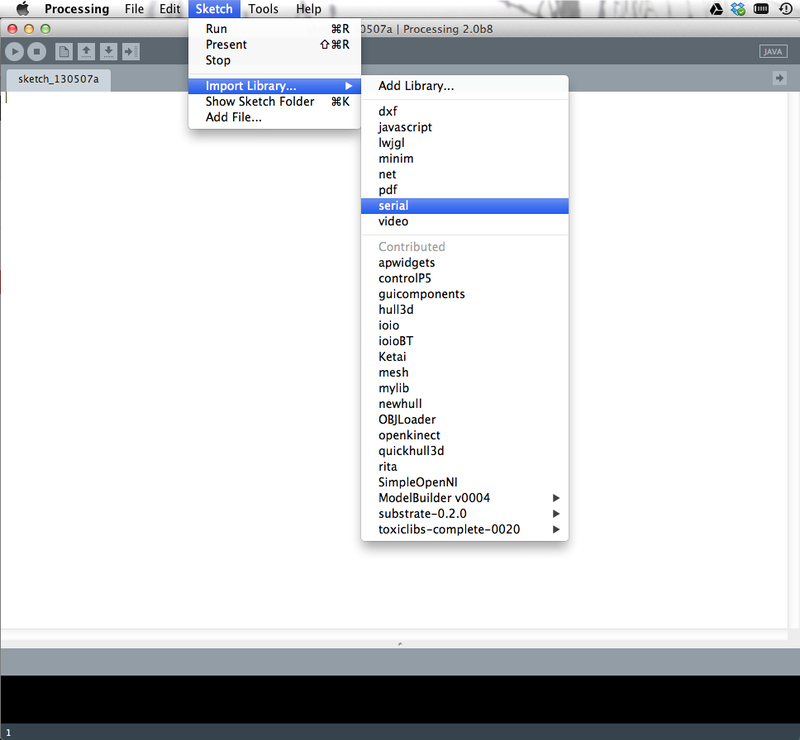 Now that you know how to send data from Arduino to Processing and back again (even simultaneously! ), you're ready for some seriously cool projects. By hooking together Arduino and Processing, you can do things like visualize sensor data in real-time, or make a glove with flex sensors in the fingers that makes penguins appear on the screen, or a command console from Processing that controls a giant array of LEDs.